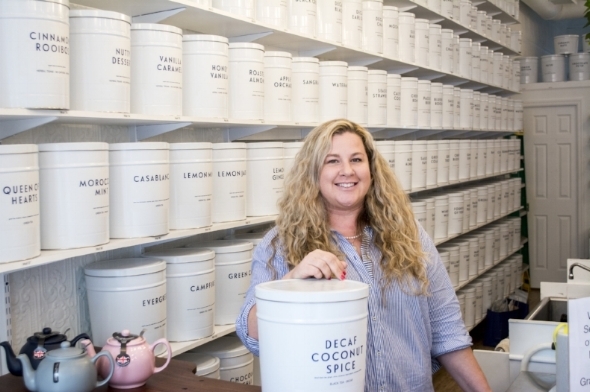 The Clipper Ship Tea Company has found a new home in Huntington where tea drinkers can scour the selection of hundreds of teas to find just what they are looking for. Originally located in Northport Village for eight years, the Clipper Ship Tea Company was damaged in the 2017 fire at neighboring Gunther’s Tap Room. After the fire, owner Melissa Wawrzonek moved the business to a temporary “pop-up shop” while she decided what was next. Wawrzonek, of Northport, said, after much thought, the decision was made to move the tea company out of Northport and into its new location at 297 Main Street in Huntington village. “We had our soft opening June 30, so we are still in our soft opening stage,” Wawrzonek said. The walls of the new store are lined with 200 different loose leaf teas, according to Wawrzonek. 100 of those are “single estate premium teas,” while the other 100 are innovative blends the Clipper Ship Tea Company is known for, including over 70 teas that are certified organic. Those tea blends include banana cream, butter cream and snow monkey. Wawrzonek, who grew up drinking tea, developed her knowledge of the blends and premium teas during a five-year course to become a certified tea specialist at the Manhattan-based Specialty Tea Institute. Wawrzonek also took the time to visit the places where many of the teas that she sells are grown. “I got the opportunity to visit India, Sri Lanka, China, Taiwan and Japan to really study tea in depth,” Wawrzonek said. After retiring from her previous job as a merchant marine, Wawrzonek decided to open the Clipper Ship Tea Company and turn her passion into a profession. In addition to the 200 loose leaf teas that currently line the wall at the Clipper Ship Tea Company’s new location, the shop also offers a variety of sleep and decaf teas, teapots, tea mugs, infusers and a selection of both local and international honey. Wawrzonek said that the tea shop will begin offering both hot and iced teas “to go” after the official grand opening. She said plans are also in the works to set up an outdoor patio in the rear of the shop. The move to Huntington is not the first time that tea lovers have seen Clipper Ship teas in town. The company’s teas are also available at Southdown Coffee, Hatch and the Book Revue Café.